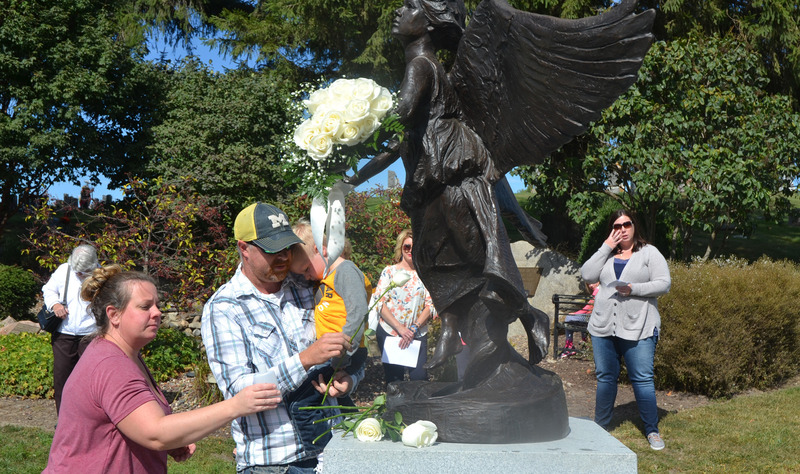 DUBUQUE — Several dozen people attended the blessing of the Angel of Hope statue at Mt. Olivet Cemetery in Key West on Sunday, Oct. 1. Music played during part of the dedication ceremony, as members of families, some with tears in their eyes, walked up together and placed white roses on the monument in memory of children who have died. Msgr. James Miller, pastor of Nativity Parish in Dubuque, led the crowd in several prayers and sprinkled holy water on the Angel of Hope statue to begin the afternoon’s ceremony. “We continue to trust in God and the hope of being reunited with those we love one day,” said Msgr. Miller. The newly dedicated Angel of Hope statue is modeled after a similar statue from a 1993 novel called “The Christmas Box.” In the book, a woman mourns the loss of her child at the base of an angel statue, the word “hope” written on one of the angel’s wings. Since that time, statues matching the description of the angel in the book have been constructed in memory of deceased children in more than 120 cities around the world, including one on the campus of Xavier Catholic High School in Cedar Rapids. The statues are intended to be a gathering point for families who have lost children, a place for them to reflect and grieve, but also be offered a sense of hope and healing. “It’s the symbolism of it,” said Angie Hume, who came to the dedication ceremony with her husband, Mike, and their living children to remember her late son. “For people with a miscarriage, it’s important to have a place to go,” she said. 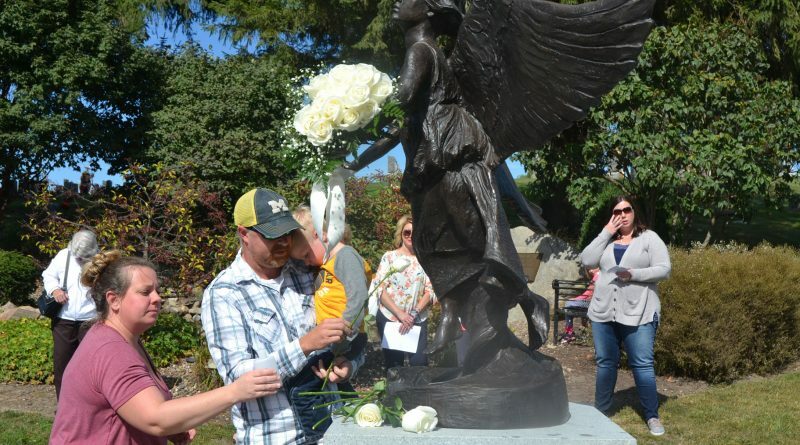 Many at the ceremony were people who have been helped by Dubuque Tri-State Share Pregnancy and Infant Loss, and The Compassionate Friends for Our Tri-State Area, two organizations who were instrumental in bringing the statue to the Dubuque area. “Share has been a big part of our healing process,” said Lisa Ruppel, who attended the ceremony with family, including her sons Ben and Teddy. “It’s a lonely process of grief when you lose a child, so the support has been instrumental to us. Our first son, Sam, we lost as an infant,” Ruppel reflected. Share is a national organization that offers support to parents who have lost children in the womb or whose children were stillborn or died in infancy. “It’s really the parents who help each other. 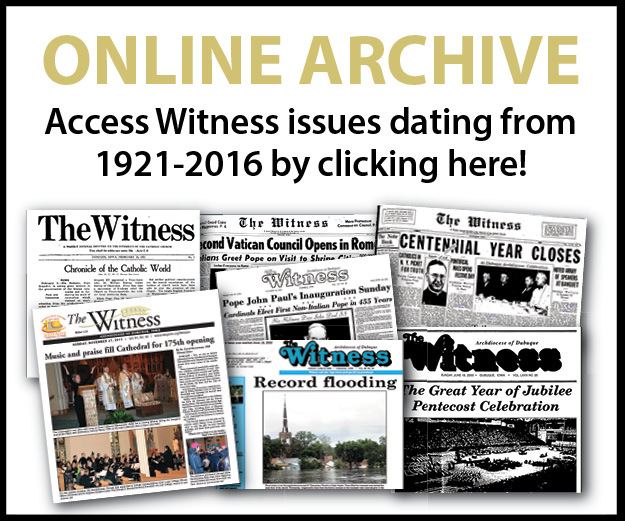 We are just there to facilitate it,” said Betty Weber, Share’s Dubuque area chapter coordinator. Weber, who was an obstetrics nurse for many years, said she witnessed families lose their babies at the hospital and felt more should be done to support them following the loss. She and a fellow nurse worked together to bring Share to the Tri-State area in 1989. The parents’ support group meets the second Wednesday of every month. Books and other literature pertaining to grief are available for members to borrow. The group also sponsors a family picnic for members every summer, a memorial or remembrance walk each fall, and a candlelight ceremony during the holiday season. After Share members learned of the Angel of Hope phenomenon a couple of years ago, they began to consider whether they should try to bring such a statue to the Dubuque area. 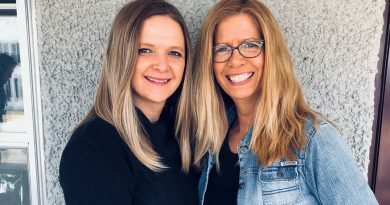 Weber knew the organization couldn’t do it alone, so she reached out to a friend of hers, Ellen Bigelow, the chapter leader of the Tri-State’s Compassionate Friends support group, for help. Compassionate Friends is a worldwide organization for those who have lost children of any age. The group has been active in the Tri-State area for more than 30 years. Members have monthly sharing sessions, meeting on the fourth Thursday of each month, and also partake in a candlelight ceremony every December. “A big thing is that when a loss happens, you feel like you’re the only person. You are so alone. 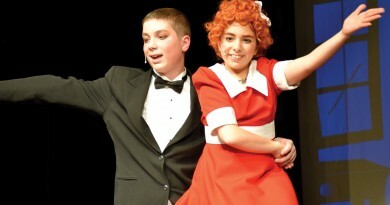 And when you come to any of these meetings you suddenly are not alone,” said Bigelow, who became involved in the organization after her own daughter, Renee, died of a seizure disorder in 1996, just weeks before her 13th birthday. Bigelow said Compassionate Friends played a critical role in her ability to process her daughter’s death. She said years later she remains involved in the organization as a way of helping other parents who are experiencing new grief. 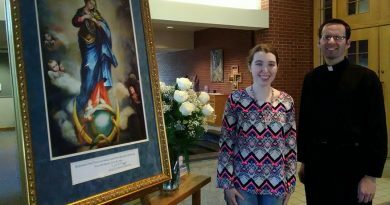 Both Share and Compassionate Friends conducted fundraising efforts, which collectively raised more than $14,500 to bring the Angel of Hope statue to the Tri-State area. Bigelow said all parents who have suffered the loss of a child are welcome to visit the Angel of Hope statue at Mt. Olivet Cemetery. Both Bigelow and Weber said they felt it was appropriate that the Angel of Hope statue was dedicated in October, when the church observes “Respect Life Month” and affirms the sacredness of all human life, from the moment of conception until natural death. ← Is there evidence of God from contemporary science?